An alleged extramarital affair causes the incumbent MP to step down. His sudden departure pits a minority candidate from the ruling party with a deep grassroots background against a veteran opposition figure with a confrontational past but also a reputation for championing civil liberties. The Bukit Batok by-election was certainly not lacking in compelling narratives. What does the result say about the issue of race in Singapore politics? Is Dr Chee Soon Juan's political comeback on track? How much does estate upgrading matter as an election issue? And is the "by-election effect" still relevant today? Insight takes a look at what lessons can be gleaned from the May 7 Bukit Batok by-election. The much-trumpeted "by-election" effect failed to work its magic for the opposition this time round. After losing two previous by-elections, the People's Action Party (PAP) won Bukit Batok with 61.2 per cent of the vote on May 7. Observers believe that in a by-election, voters are more willing to support the opposition as there is no danger of inadvertently voting the Government out of power. So why did the by-election effect not propel the Singapore Democratic Party (SDP) to victory? First, for all its purported potency, it is not easy to pinpoint specific instances of the by-election effect at work. In the first 15 years of independence, the PAP handily won all 11 by-elections that were contested in a bygone era when the ruling party held every single seat in Parliament. Then came the seminal 1981 Anson by-election, which saw the PAP vote share plummet from 84.1 per cent to 47.1 per cent within a year - a 37 percentage point swing. While this is a seemingly powerful example of the by-election effect, the PAP's analysis identified a unique local issue that was a key reason for the defeat. A large chunk of the voters might have expressed their dissatisfaction at the ballot box as they were going to be resettled and were not given priority in getting new Housing Board flats. Since Anson, there have been four by-elections, and the Workers' Party (WP) has won two of them. But those two victories also do not conclusively prove this by-election phenomenon. The 2012 Hougang by-election was contested in the WP stronghold, which it had been holding since 1991. It came as no surprise that it easily retained the seat. In the 2013 Punggol East by-election, the WP won a much closer fight. But there were also unresolved local issues such as uncompleted upgrading works at Rivervale Plaza and a lack of coffee shops in the new estate. The PAP's candidate was a new face that was unfamiliar, while the WP candidate had a degree of recognition, having contested there in the previous general election. To find the most convincing instance of the by-election effect, one has to ironically look at the 1991 General Election. Opposition MP Chiam See Tong devised a strategy to contest fewer than half the parliamentary seats so that the PAP was returned to power immediately on Nomination Day. With the guarantee of a PAP Government, voters were thus free to vote for the opposition, he argued. Fighting a general election as a by-election would achieve what he termed a "by-election effect", a turn of phrase that endures in Singapore politics till today. The strategy is widely credited with delivering four elected parliamentary seats to the opposition, a record that stood until 2011. But is the by-election effect still relevant in today's political climate, where voters have shown an increasing desire for diversity in Parliament and more alternative voices? After all, the biggest opposition breakthrough to date - the WP's win in Aljunied GRC, the first time the opposition won a GRC - was achieved in the 2011 General Election when all but one constituency were contested. The opposition has also not pursued the by-election strategy in the last three general elections, contesting more than half the seats in 2006, 2011 and 2015. Last year's elections even saw all constituencies challenged for the first time since independence. The result of the Bukit Batok by-election seems to confirm the receding influence of the by-election effect. Undoubtedly, some voters felt unencumbered to vote for SDP's Dr Chee Soon Juan because they were merely choosing an MP and not determining the government of the day. But perhaps Bukit Batok merely confirms what past results have suggested: The by-election effect does not exist in isolation, as other factors such as local issues and the quality and familiarity of the candidate play a crucial role too. During the Bukit Batok by-election campaign, when the People's Action Party (PAP) candidate Murali Pillai said he would implement a $1.9 million infrastructure plan should he win, some were quick to point out that his upgrading promise seemed conditional. Mr Murali's rival, Singapore Democratic Party chief Chee Soon Juan, said it was similar to the PAP's strategy in the past of using lift upgrading to win votes. Opposition MPs weighed in, too. Non-Constituency MP Leon Perera of the Workers' Party said in a Facebook post that Mr Murali's announcement "recalls the painful memory of the votes for HDB upgrading message in the 1997 General Election", and questioned if such a campaign message was necessary. But Mr Murali was quick to distance himself from the carrot-and-stick approach, explaining to the media that the Neighbourhood Renewal Programme he had talked about was "funding-neutral". This meant the funds would be disbursed to whichever MP was running the town council, and were not dependent on the PAP winning the by-election. It indicated that the tactic the PAP had unabashedly used up till the mid-2000s to woo voters - by dangling upgrading goodies and delivering them only if the PAP MP was elected - would no longer work now, some analysts say. It is a matter of fact that when you have a PAP Government, the PAP town councils are better placed to acquire grants from the Government, although of course there are other criteria. But that is the advantage of being the incumbent. FORMER NOMINATED MP ZULKIFLI BAHARUDIN, who managed two town councils in the 1990s. Former Nominated MP Zulkifli Baharudin, who managed two town councils in the 1990s, says: "It is a matter of fact that when you have a PAP Government, the PAP town councils are better placed to acquire grants from the Government, although of course there are other criteria. But that is the advantage of being the incumbent." But the PAP Government knows it has to be fair to all constituencies, including opposition-held ones, as the electorate matures. "Increasingly, voters want to see more fair play in our political contests and will scrutinise more closely the PAP's value of fairness," he adds. Singapore Management University (SMU) law academic Eugene Tan says the ruling party's upgrading message would likely hurt its campaign if done in an opposition-held constituency. But the message had no significant impact in Bukit Batok as the seat had been under the PAP since it came into existence in 1972. "Residents have come to expect value and continuity from the PAP, and upgrading is an integral part of its track record and value creation," he says. Indeed, pavilions, parks, fitness corners and covered walkways linking several blocks are a common sight in the constituency. All eligible blocks have had their lifts upgraded to stop on every level. Residents' gripes about the estate were mainly minor, or unwarranted in some cases. Take housewife Kylie Wu, 51, who had said: "I hope they will build enough covered linkways such that, on a rainy day, I don't need to use an umbrella when I go out." But as it is, there is a sheltered walkway near her block leading to a coffee shop and stores two blocks away. If Madam Wu wants to get to the market and the bus stop, she need only open her brolly once to cross a road. 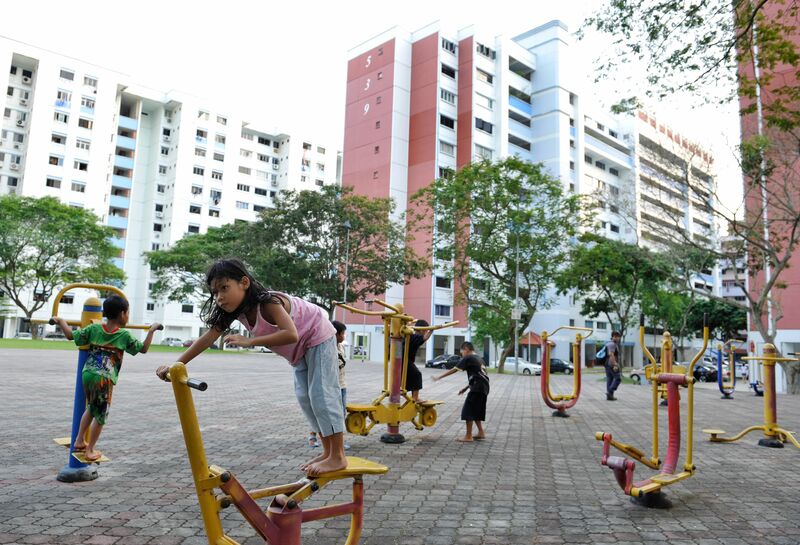 Dr Gillian Koh, deputy director of research at the Institute of Policy Studies, says upgrading, estate renewal plans and town council management come under the issue of liveability, though some residents may also view estate issues as having an impact on the value of their housing assets. She explains: "In the HDB heartland, especially a place like Bukit Batok, the 'liveability' issue is very much affected by the quality of the town council and what the state can offer to improve the estate. "This is different from constituencies with more condominiums and private housing estates." She adds that both by-election candidates had identified estate management as a key issue as they sought to convince voters of their value to the estate. Dr Chee had tried to assure residents the SDP was prepared to take over the town council from the PAP, and was confident of running it well. Even before the Writ of Election was issued, the party had put together a four-man team ready to help with transition issues should he win. But Mr Murali, with the incumbency advantage of having grassroots leaders who were strong on the ground and knew what enhancements were wanted, had announced fresh neighbourhood renewal plans, says Dr Koh. When the upgrading tussle erupted, "the PAP team clarified that... these were plans it had come up with and any other party can come up with its own plans and go through the same process (of implementing them)", says Dr Koh. Still, SMU's Associate Professor Tan points out that highlighting town council management is strategic. "It (the PAP) has been emphasising to residents that it is a party that can be trusted: It promises and delivers," he says. "It is indirectly reminding voters that the opposition party can promise the sky, but can it deliver?" For now, the SDP needs to gain trust on the ground, says Dr Koh, adding:"The ground game matters. Politics is local and if you can grab enough trust and credibility, voters give you the mandate to speak at the national level in Parliament." As 42-year-old Bukit Batok resident Christopher Tong puts it: "Everything in this estate has been going well so far. The area is clean and any issues are resolved quickly. So I don't see a need to change anything at all."